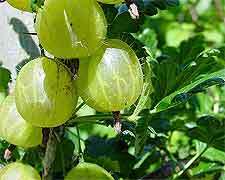 Quickly rinse the gooseberries and put them straight into a stainless steel saucepan or similar. Pour over enough water to cover the fruit and then add in the bunch of freshly picked mint. Boil the gooseberries and mint for 30 minutes, or until the gooseberries are beginning to fall apart and pulp, with softened skins. At this stage, take the beginnings of this jelly mixture off the stove and strain it through muslin or a jelly strainer, leaving it to drip freely for several hours. Measure the collected juice and for each pint of liquid that you pour back into the saucepan, add 1 lb / 500 grams of white sugar. Bring the mixture to a boil, stirring in all of the sugar so that it fully dissolves before the jelly starts boiling. Boil hard for ten minutes, by which time a reliable setting point should have been obtained. Test this by dripping some of the gooseberry and mint jelly onto a plate (chilled earlier in a fridge or freezer). After one minute, the jelly should be firming up and forming a skin, which is particularly obvious when you run your fingertip through it, as it will 'crinkle'. If it is obviously not yet ready for its set, boil for another five minutes and then re-test, and carry on in this fashion until ready to jell. Take the saucepan off the heat, skim off any surface scum, and then pour your jelly into glass jars (these must always be sterile). 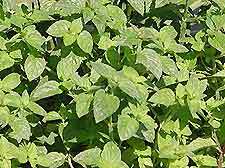 If you prefer a stronger mint flavour, then add another bunch of mint to the mixture during its final boil, or alternatively, mix in some chopped leaves at the very last minute, just before bottling. Mint and Gooseberry Jelly Recipe - More Jelly Recipes.